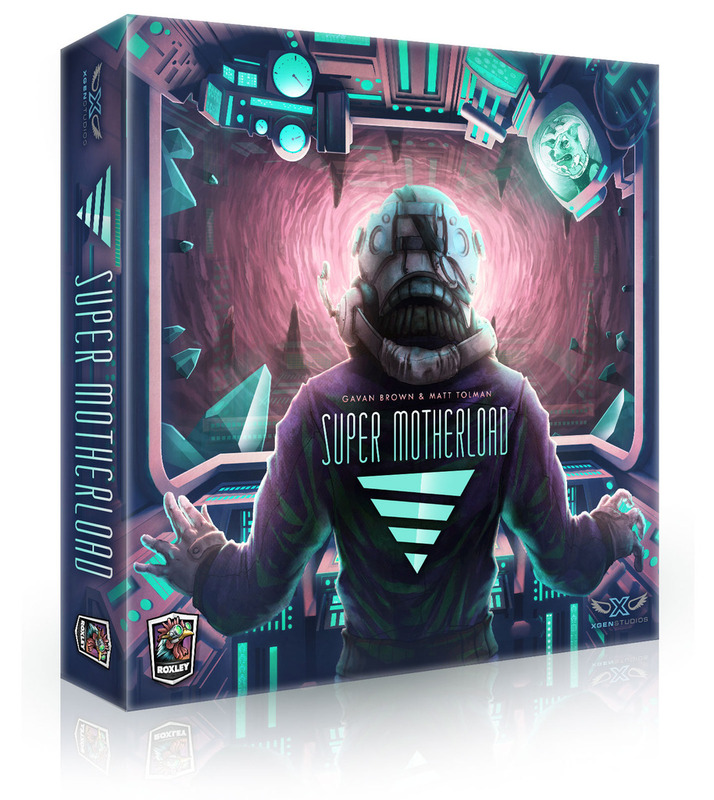 What is Super Motherload like? In Super Motherload you will have your own unique set of cards. You will start with 7 of them in your deck and 16 available to add to it later by, spending the minerals you get from mining. These extra cards are more powerful than your starting cards and will be worth points at the end of the game. 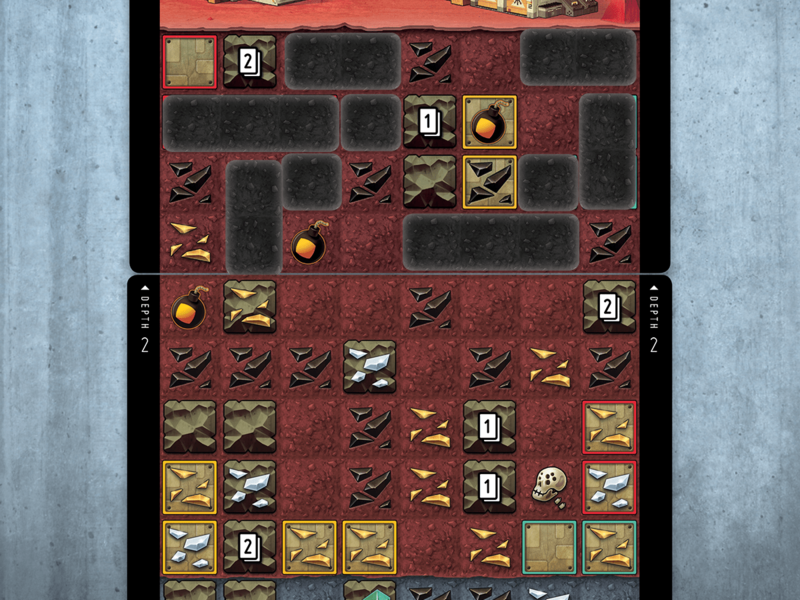 Super Motherload is played over several turns. On your turn you can take two of the following actions: Draw, Drill or Bomb. Draw lets you draw two cards from your deck, and you will need to do this often since the other things you can do will deplete it. Drill will be the most common way you get to minerals. You do this by discarding as many cards as you like of the same colour, and then you place a black tile on the main board equal in length to the amount of cards you discarded. The minerals you covered this way are yours to keep. Drilling can done vertically or horizontally, and must connect to either the surface or some of the other covered up areas (where someone else drilled before you). Some areas can only be drilled with specific colours and there are even some areas that can’t be drilled at all. This is where the Bomb comes in. Some of your cards will have a bomb symbol on them, meaning that you can (if you have a bomb token) discard the card and a bomb token to blow up stuff. The pattern differs for each card used, but in general it’s different from the normal vertical and horizontal lines you do when drilling. As with so many other games this game is about getting the most points. So how do you get them in Super Motherload? You can get them in two ways: By completing minor and major achievements. And by upgrading your deck. The minor achievements generally support things you would or could normally do on your turn, while the major achievements support getting specific cards for your deck. Upgrading your cards will be the main way you score points in the game. So the question is how do you upgrade them? 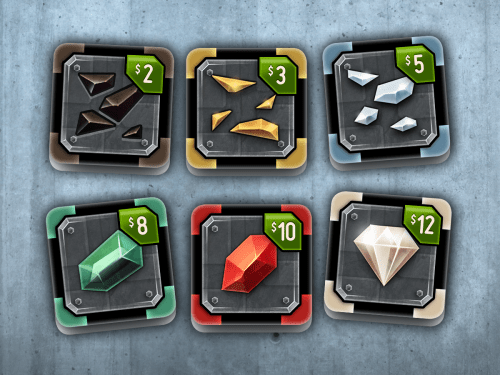 Simple really you upgrade them by collecting a certain amount of minerals. Once you have bought them they are added to your deck, so not only have you gotten points, but you have also enhanced your deck. There are four game boards in the game. At the beginning of the game only one of them will be in play. As soon as all the artifact spots are covered on that, the next game board gets revealed. This continues until all the artifacts on the 4th and final game board are covered, at which time the game ends. In spite or the strange title Super Motherload is a great game. It’s easy to teach to others and a lot of fun. You’re always interested in what’s happening on the main board and you don’t have to wait long for your turn. 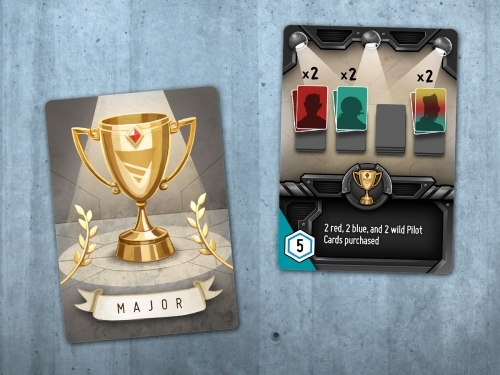 The achievements add a little extra variety to the game, as well as the fact that each of the player decks are all slightly different. I do fear that the game can become a little dull over time, since nothing really changes. The game can also suffer at bit from runaway leaders. And I am not a big fan of the overall art style of the game either. It’s definitely a game I enjoyed playing. Yelling and shouting at people for digging their way to all the valuable minerals just before you. The digging theme comes through very well indeed. It’s clear the mechanics of this game were made to support the digging element. While the art style is simple and works well on the board I feel it is a little weird-looking on the cards themselves. Very unique though, and some of you might think it’s awesome. Component quality is very high, along with a well written and nicely illustrated rulebook. The rules are easy to understand and teach. The actions you can do on your turn are simple and easy to understand. This is a game that should be accessible to most people.